What I want to know is "Where's the dip?" These Barksters Krisps have an air-puffed quality that makes them a perfect pairing for a great dip. I'm sure Tanner and Oliver would agree, but I've got to keep them focused. I have a challenge for them today. My boys have been in training for self control for sometime. They do very well with our photo shoots. Today I'll put them to the challenge with food in their face; well almost. Let's see what happens here when I push them a bit. "Okay, boys, I want to see you step it up a bit. Who can show me a treat on their paw without eating it? Good job, Oliver! How about you, Tanner? Can you match this trick?" "Oh oh! Oliver....Tanner trumps your one paw with a two-paw treat hold. What can you do to up your annie? A stack of treats? C'mon, Oliver! They're not on your paws! Let's see if Tanner can put a stack of treats on his paws. Or maybe he can come up with something more creative. Tanner?" So There! Can You Beat that Oliver? Tanner's pulling out all the stops. He's got a Barksters Stackster on each paw and check out his back. It's a Barkster Backster! I had to test out Loving Pets' Store Locator to see where I can buy their products near me. There was good news; I got a long list of major national chains (all the big guys) and smaller pet boutiques as well. I don't think you'll have much trouble finding them near you. A quick check online found the product easily available through Amazon as well as other online retail outlets. 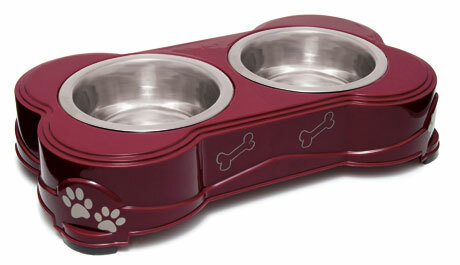 Barksters also has several beautiful lines of serving bowls and treat storage too. Check out the Dolce Diners page, their newest addition. I got a beautiful sample in the Merlot. The cool features of these bowls are that they fit easily in the holder so Fido doesn't run off with them (does your dog do that? ), the bowls are dishwasher safe, the holders couldn't be more cute, and they come in both large and small sizes for your particular pup's preference. Full disclosure: Loving Pets provided me with a Dolce Diner and some Barksters Krisps to review. No purchase is necessary to enter this giveaway. I was not compensated to offer this opinion and the comments in my review are my own. I liked the vegitopia products. I have a food dehydrator already, and I've been meaning to start making treats with it. I know for sure they love dehydrated apples! I loved the vegitopia treats! Schooner and Skipper love treats so they would love to have Vegitopia™ 100% Natural Fruit and Vegetable Treats for Dogs in the Dolce Diners Quart Size and in the Espresso color. Schooner and Skipper stopped by "Loving Pets" with a picture to let them know we saw the giveaway at "All Things Dog Blog"
I love the treats they have. I think Molly and Roxy would like the Gourmet chicken wraps as they love apple, banana, sweet potatoes abd carrots, Gourmet Meat Strips too! I think they would want the papparazzi pink or Merlot Dolce Diner in large. Also they LOVE the Barksters Brown Rice and beef and only have 2 left and I would love them to try the other flavors. Felix and Kol got to try the Barksters last month and they loved them! Felix also adores the veggietopia treats! I like the All Natural White Rawhide Spiral. My dogs are crazy for the Gourmet Chicken Wraps Dog Treats. I really like the expresso colored dolce diner. I love the artistic no-tip dishes! Super cool. I like the Dolce Diner in pink. I rescued another doggie the other day and she's our first little girl so I have been going crazy with the pink. Lol. As soon as I got paid after that I bought her a pink leash and a pink polka dot dress. Lol. I am also really loving the Loving Pets Vita-Hide Joint Formula for my 8 year old lab. He's starting to move a little more slowly. I'm so excited about your blog. I love finding blogs about doggies and even better giveaways for them. My babies love getting mail so I enter to win as many things as I can for them. Lol. Thanks for all. I like the Bella Canister, it is so classy looking. I'd love the Vegitopia treats. I liked the Silent Double Diners. I love their Gourmet banana chicken wraps! Actually I like all their chicken wraps and meat sticks! Yummy! I have been eating them since before I was a year old.